Are there animals in heaven? I have friends who firmly believe so. I really don’t know, but what I do know is that God cares about all the animals, our pets, and our love for them right now, right here on earth. We can see in the Gospels that God loves birds. In both Matthew 10:29 – 31 and Luke 12: 6 – 7, Jesus asks, “Are not two sparrows sold for a farthing? and one of them shall not fall on the ground without your Father” (Mat 12 v29 KJV). And, remember that God wanted to save all the animals from the flood; when Noah was building the ark God told him in Genesis 6:19 – 21, “And of every living thing of all flesh, two of every sort shalt thou bring into the ark, to keep them alive with thee; they shall be male and female” (v19 KJV). Many years ago, a dear friend gave me a little black kitten for Christmas. But first, let me tell you . . . This little black ball of fur, no bigger than a minute, came complete with a bow. I named him Christmas Kitty and he was often referred to as CK. My kitty came with a rather unique marking – he was short-haired and his sleek black fur shined like obsidian … except for one spot! On the back of his head, he had a circle of white fur! Immediately, I decided that was his halo – no heathen kitties in my home!!! Christmas Kitty and I made friends quickly. I placed a ‘break-away’ collar and bell on him so I always knew where he was; he seemed fine with that. I had to replace that collar regularly. I thought I would leash-train him; yeah right. Did you ever try to lead a cat? It’s like trying to harness sunshine in a box. CK was the epitome of all of the cat lore that has ever been written. He grew into a fine specimen and was very proper! Christmas Kitty was extremely aloof as though he were a descendant of aristocracy. He didn’t like most strangers on first sight, but if one would leave him alone, he would eventually warm up – in his own time. Those who didn’t believe this characteristic of his would soon be the recipient of one of his famous scratches! Christmas Kitty and I were together for nearly 10 years. I had long forsaken the collar and bell and lived to regret that. While cleaning out and packing up my apartment to move from Colorado to Virginia, my kitty got out when the door was left open. I didn’t discover he was missing for about 24 hours; I never found him. I don’t mind telling you that I was really hurting; he had been my sole companion for quite a while. I looked and asked but found no sign of him. I even looked in and around the dumpsters where the raccoons hung out, wondering if he had become their supper. There wasn’t time to advertise as my departure drew near, so I left CK and my loss in God’s capable hands. I prayed that Christmas Kitty was okay and asked God to show me just that. Moving day arrived and off I went in the Big Truck, moving to the east coast. About halfway to Virginia, I went into a truck stop for gas and food as was the norm. I got ready to hit the road again, and when I paid for my meal, there, by the check out were all kinds of small items for sale; you know, the kind you buy on impulse. I usually avoid even looking at these things, but ONE caught my eye. 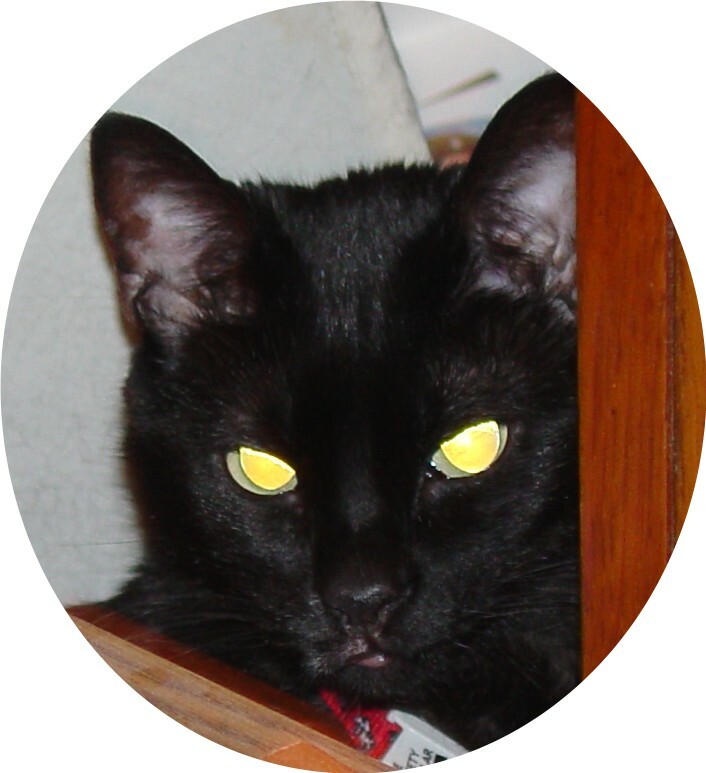 It was a little black CAT lapel pin, less than an inch tall and he was sporting a tiny gold HALO. I purchased the simple little bit of Collateral Grace. In that little pin, I saw the peace that I had asked of God and the assurance of the safety of my Christmas Kitty. Once again, I asked and God responded. God gets us through the big heart wrenching problems of life, and He is also present in the everyday small things; like losing a well-loved pet. Please, won’t you ask in Jesus name what you need and want, seek His perfect will for your life and knock on the door of His heart? He will answer. Delight yourself in the Lord, and He will give you the desires of your heart Psalm 37:4 (KJV).